The Meditub 3053 is a beautifully constructed 30×53 walk-in bathtub that will fit into any US standard 60” tub opening. This walk in tub is available with a right or left inward swinging door and is constructed from heavy duty reinforced fiberglass with a gel coat finish. It’s equipped with an ADA Compliant 17” contoured seat providing ultimate comfort. This walk in bath tub is available in several variations such as whirlpool only, air only, with a combination of both whirlpool and air systems (dual system), or as a soaker, with no jets at all. All of our water massage jets have a 360 degree range of motion to provide maximum comfort and versatility. This 30×53 walk-in bathtub includes adjustable feet for easy installation and leveling. Deluxe Hydro Massage System includes a 1horse power pump with directional water jets. The whirlpool massage system includes (h_jet) 360° color matched, directional and adjustable water jets. Each individual water jet is also fully adjustable as far as pressure or velocity of water also included is a FREE Inline Heater which maintains a consistent water temperature, rated at 15 Amps 125 Volts AC, 1 Nema Plug. 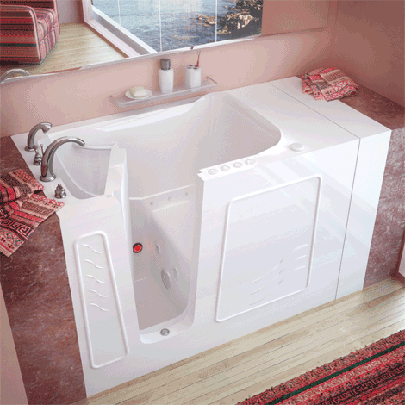 Enjoy the luxury of bathing once again, simple, safe, comfortable and convenient with a walk-in tub from Meditub. There is no straining or struggling to get in or out of the tub when you own a walk-in bathtub. Makes warm baths or soothing showers accessible to people who thought they’d never enjoy the luxury on their own again. The walk-in tub door, low-entry step (5 in. ), Built-in grab bar and slip resistant tub floor are just a few of the features that make independent bathing secure in a Meditub. Built-in chair-height seat allows you to conveniently experience a comfortable, full body soak without the struggles of getting up and down.